Before Game 3 of the Fred Page Cup Final on Monday, Michael Santaguida was named the BCHL's Player of the Week. It's the third time this year that the Surrey goaltender has picked up the award. 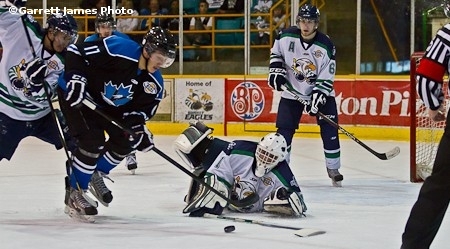 Surrey Eagles goalie Michael Santaguida has been named the Gongshow BCHL Player of the Week for the Week ending April 14, the league announced Monday. Santaguida was busy Saturday night, making 50 saves to post his fourth shutout of the postseason as Surrey took a 2-0 lead in the Fred Page Cup Finals over the Penticton Vees. He earned 1st Star honours and was also named the FortisBC Energy Player of the Game. In Game 1, the Mississauga, Ont. native made 31 saves and has a .976 save percentage to go along with a 1.00 goals-against average so far in the Finals. He is now 12-1 in the playoffs.